#MashujaaDay : Ezra Chiloba leaves office for three weeks to attend his child birthday. #EzraChiloba - Bana Kenya News, Real African Network Tubanane. The IEBC CEO has decided to leave the office after the chairman's speech that indirectly pointed out the people who were stumbling block for free and fair elections. The IEBC CEO Ezra Chiloba has been seen colluding with the Jubilee and blocked the Credibility of elections. Mr Ezra Chiloba said he had taken a personal decision to take leave in light of the opposition's demands, without giving more details. He said all arrangements were in place for the election, as ordered by the Supreme Court. Chiloba will start his leave on Monday. "This is the first time I'm taking leave since my son was born. He turns two years (old) in two weeks' time," he told Reuters. The Ezra Chiloba three weeks leave will make the Commission breath as it has been under constant attack from different people in Kenya. 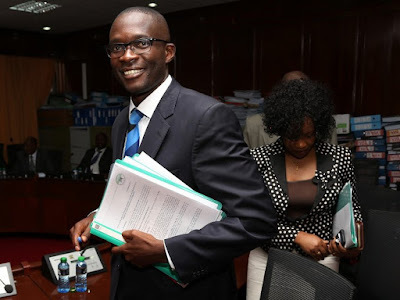 It looks like now Chiloba has been the most unwanted person in the Kenyan elections board. People have been demonstrating and others died in the name of Ezra Chiloba. Protest from almost 30 counties in Kenya went around chanting "Chiloba Must go". The decision of taking leave was reached after discussion with his wife and more so they child birthday next week led to the decision.